No interest in cars in the past?! Hello! This is Tetsuya Hibino! In this column, I will be speaking about my past and my career in drifting. My profession is the owner of Sunrise Auto, located in the Aichi Prefecture. This place has only been open for 3 years and it started off as my very own tuning garage where I built my personal drift machine. These days Sunrise isn't exactly an all out business place but a spot where all the local racers hang out and talk about their passion. The truth is, I never started drifting because I loved cars. It started off when I was into motorcycles, I always thought that the people who drifted were obscene and took up too much space. In my life growing up, I have never taken the slightest interest in drifting, or cars. When I turned 18, I was forced to buy a car only to transport my bike to the nearby race tracks. Don't give up until you win!! I fell in love with motorsports when I was 16. My first purchase was a sportbike which I rode every night with my friends in the mountains. As I started to master more and more technical riding skills, my needs spilled onto the race tracks. I wanted to experience the real speed involved when riding at a race circuit. Frequently attending races, my life was all about motorcycles back then. Nonetheless, when all my friends were at an age where they got their driver's license, everyone started to drive cars instead. I still kept on riding bikes since I felt as though there was plenty skills left for me to master. One goal I wanted to fulfill before I gave up bikes was to actually win a race. In the end, I finally satisfied that one win after many years of attending the races and giving it my dedication. Since there is a common conception of a person that rides bikes will most definitely injure oneself at one point or another, this theory ended up being true. At 21, I ended up stretching a tendon on both my knees. I was unable to go to work for three months since I was in a cast. That whole experience made me think that it was about time I gave up riding bikes. After that, I sat shotgun in a friend's car while drifting. This friend used to ride bikes as well, but not as long as me. This made me realize that I had enough confidence to become better than him and to challenge this sport called drifting. The transition from bikes to cars occurred during this point in my life and I was prepared to start driving cars sideways. I tend to have this personality where once I decide to do something, I won't be satisfied until I do it. The day I decided to try drifting, I talked to my friend and had him source a vehicle for me. This is where I was acquainted with the hachiroku AE86 2 door Levin. Although I tried drifting as soon as I got the car, I really didn't understand the first thing about this sport. Later I learned that there was no LSD in the car. I started off realizing that the car needed to be modified in some way, but I had no idea where to start. Luckily, the people that I hung out with helped me understand what it takes in order to drift an automobile. The car transformed into a good drift car immediately, but my driving technique still needed a lot of work. It was simple just to ask for help from one of my friends, but I had this ego and unnecessary pride that stopped me from asking. I don't like it when things are explained in a simple manner anyways. Therefore I never asked people to teach me, but asked if I can ride shotgun. That way, I can observe and learn myself. As soon as I began to get a firm grasp on drifting, I began to research and study techniques on my own. Recognizing the hachiroku's weaknesses and realizing its strong points (lightweight, fast cornering), I thought about how to make this to my advantage. The enlightened conclusion I came in terms with are skills that I still use while competing in D1 today. I have owned 10 cars in the past but overall I still am very attached to the AE86 since quick turning vehicles are my favorites. Even my AE86 that was fitted with an SR20DET still maintains the hachiroku's original suspension layout which is a solid rear axle. I hope that from now my true self can be expressed by the way I drive my hachiroku. I tend to take interest in lots of weird things in my life. Once I take interest, I usually end up devoting lots of my time towards it. This is why lately I try not to take interest in new things. I've been wanting to try golf at the moment, but I know that if I start, it will conflict with my drifting. No golf for me! Things that I take interest in that don't take up the majority if my time is a puzzle ring. Whenever I have a little bit of time, I take it out of my pocket and try to solve that puzzle. 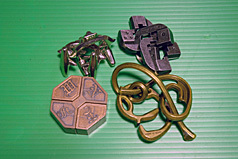 Now I'm very good at these puzzle rings. I also like manga comics as well. Every month I roughly even buy 10 books. I probably can even open up a comic book library since I have more than 2000 books at home. Since that's how my personality is, I try to focus more on my drifting. I will not give up drifting until my satisfaction is fulfilled. Many say Tetsuya Hibino = Ebisu's jumping drifter, and this statement came to becoming a fact at the 2004 round 3 of the D1 Grand Prix where I was matched up against Ken Nomura. That heated final battle at Ebisu, I will never forget. Although I ended up losing to him it was one of the greatest battles that I have ever faced. People often ask me if I'm scared charging in the entry turn at abnormal speeds, and if I say that I wasn't that would be a lie. Plummeting into a turn with a properly tuned machine still has room for fatal errors if the vehicle won't move the way I want it to. Whenever I think I'm going to crash and I see things in slow motion is the scariest. I'm often scared when I ride next to my friends when drifting too. I would like to keep striving in the D1 and Street Legal series as a privateer driver aiming for a big works sponsorship! I would also like to get involved in racing other than drifting such as grip. Once I master both drift and grip, I can acknowledge myself as a person that is good at driving cars. 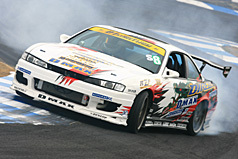 Never letting go of my drifting style in any stage I'm at, I look forward to your continuing support! Hibino competes concurrently in the D1 Grand Prix and the Street Legal series. 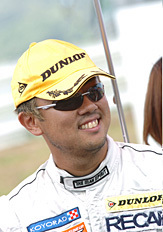 In round 3 of the 2004 D1 at Ebisu, he displayed his infamous jumping drift. By doing so in an AE86, he was recognized as a serious competitor by the judges. 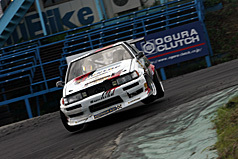 Hibino may have a strong image linked to the AE86 however he competes in a S14 Silvia in the Street Legals. His drifting style has not changed nevertheless. 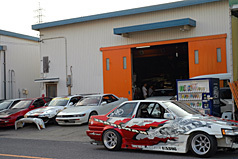 Sunrise Auto is located in the Aichi Prefecture where Hibino is the owner. At first, this garage started off as his own place to work on cars. The local racers come by often to hang out. The modifications to the D1 AE86 are done after careful discussion with the mechanics. Hibino will test drive the cars and provide specific feedback to the mechanic. 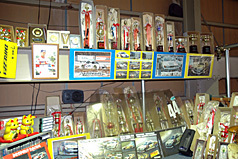 The trophies are lined up to remind Hibino of many of his memorable victories. He intends on getting more trophies once he starts racing grip. Since Hibino claims he thinks too much, he uses the puzzle ring to take things off his mind. He takes interest in matters that train not only the body, but his mind as well.